Daily Messes: What Kind Of Cereal Do You Eat? What Kind Of Cereal Do You Eat? Growing up, I remember eating "healthy"cereal. I remember being excited when my Dad did the grocery shopping because we would sometimes get Cinnamon Toast Crunch! The hubby, boys, and I were all at the grocery store over the weekend doing the shopping for the week. The kids are always asking for the 'sugary' cereal, especially since a lot of the boxes have fun looking cartoon characters on them. Hubby is convinced all cereal is junk so I started reading the labels. It surprised me. Ignore the name of the cereal and look at the nutrition labels. Most of the cereals had different serving sizes (3/4 cup to 1 1/4 cups), which makes it super confusing when trying to compare the labels. I adjusted the serving sizes and nutritional information so that they are all for 1 cup of cereal. I don't measure out 3/4 cup of cereal in the morning. I generally fill my bowl to the same level no matter what the cereal is and that usually amounts to 1 cup. Click on the table to make it larger. Who knew that Fruit Loops and Lucky Charms had fewer calories and less sugar than Raisin Bran? I guess the best cereal answer for me is Kix. Just to make it more interesting, I did a comparison on some candy, yogurt, and Bernardo's favorite soup (tomato). Click on the chart to make it larger. Line-up of candy and cereals based on calories and fat content. ends with Peanut M&M's at 250 calories. Dark Chocolate Caramels, Pretzel rods, Jelly Beans, Combos. dry Quaker Oats oatmeal, Kit Kat's, plain M&M's, Peanut M&M's. Did you know that if you simply compare the calories and the fat content of some cereals and candy, the candy is the same or better than the cereal? 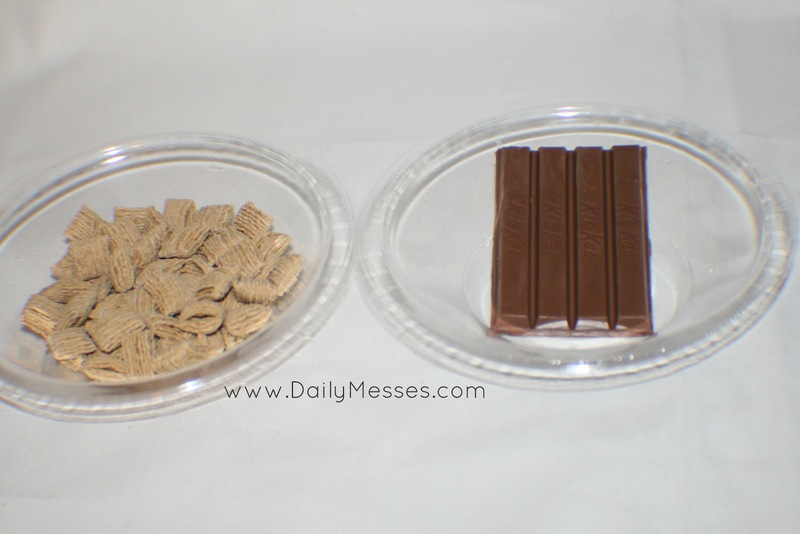 A serving of Quaker Oat Squares has 210 calories and 2.5g fat; a serving of Kit Kat's has 210 calories and 11g fat. 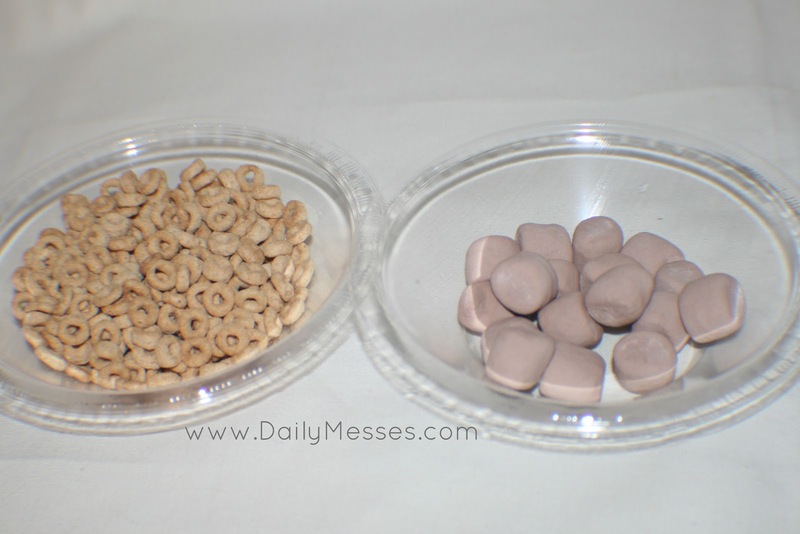 A serving of Kraft Chocolate Marshmallows has 100 calories and 0g fat; a serving of plain Cherrios has 100 calories and 2g of fat. Personally, I think I'll take the Dark Chocolate Caramels (100 calories, 7g fat) over a bowl of Cinnamon Toast Crunch (173.3 calories, 4g fat)! I'll throw in a multi-vitamin for good measure. I'm not advocating feeding children candy for breakfast. My kids already have enough crazy energy in the morning, they certainly don't need candy. However, based on the nutritional information, cereal probably isn't the way to go for me either. Higgins loves eggs, so I'll make him eggs or egg whites with a side of fresh fruit. Bernardo loves yogurt, so he'll probably get that with fresh fruit. They'll both get milk. I try to get them to eat healthy and help them make healthier choices. I believe the less processed the food, the better. When you see Kashi, which is supposed to be a healthy cereal, with virtually no vitamins or minerals listed it is because they do not "fortify" their cereals. What does fortify mean? After the grains used to make the cereal are processed, they often loose a lot of their original minerals and vitamins. The manufacturer then adds vitamins and minerals back into the cereal, which means more processing of the food. I also try to feed them as many organic foods as I can (especially dairy and meats). There have been so many new studies out about the negative side effects of transfats, pesticides, preservatives, growth hormones, and genetically modified foods (GMO's) that I think that the less processed the food, the better for my kids. Right now I can't afford have an all organic and non-processed lifestyle, but I do focus on the top ones (eggs, milk, etc.). I also just switched the kids to Greek yogurt since it has less sugar than regular yogurt. When we do eat cereal or bread products, I will go for whole grains and ones without high fructose corn syrup. Advertising is confusing. The serving sizes are not similar and that makes it really hard to compare the nutritional information. I often look at the nutritional values without looking at the serving size first, because I assume (incorrectly) that they're all the same for similar items. That can (and probably has) lead to bad decisions. Make sure you look at the nutritional labels and not just the "whole grains" and other gimmicks the manufacturers use. I really love this post! It is great "food" for thought! I honestly didn't realize all of this. Time to change up our breakfast! !